Let us see some more points in connection with National Income. Labour of a country with the help of the capital works on the natural resources of a country thereby producing certain amount of goods and services the total value of which is known as the National Income. The difficulties in arriving at exact National Income have also been pointed out. Briefly, a product can be taken into account at various levels of transport to the ultimate consumer; even, the question of barter is also referred to. 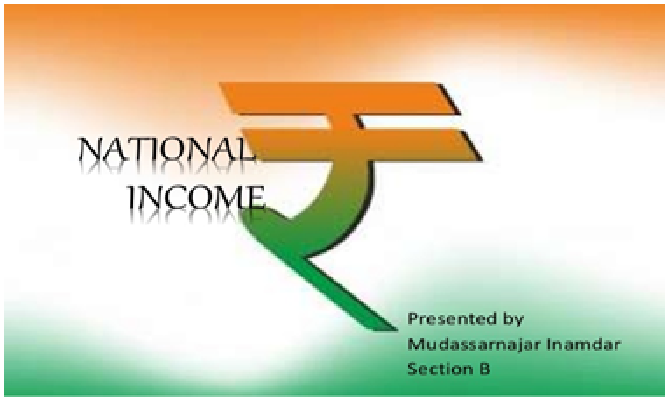 The concept of National Income comes to use when the distribution of income in the society is assessed. First, it tells us whether the income is equitably distributed in the society which is not normally possible and when it is not equally distributed, it helps us find out how vast the inequality is in the distribution of income. Since it is looked upon as the over-all economic activity of the nation, it is commonly accepted as the index of economic condition of a country at a given period. Where there is income it is but natural there must be some measurement of income; that is, how much and how much more or how much less�these are the common ways of approaching income. This is applicable for personal income too. How much I earned last year and is it more compared with the income of this year or less? The economists say there are three methods of measuring the national income; they are the product methods, the income method and the expenditure method. In this method, the money value of all final goods and services during a year is taken into account. By final goods, it refers to those products, those goods that are directly consumed away and they are not used in further production of some different product. In other words, all such goods used in another production process are called intermediate goods. Since their money value is already included in the value of the final goods, their inclusion will lead to erroneous calculation. The money value is calculated at market prices; so, the sum total is GDP at market prices. And to this must be added the net income from abroad which would give us National Income. In this method, we have to consider the four factors of production that fetch revenue; they are labour, capital, land and entrepreneurs. Labour gets wages and salaries; capital draws interest; land invariably gets rent and entrepreneurs acquire profit through their enterprise. Entrepreneurs are in one sense self-employed people in the domain of business; but there are some different kinds of self-employed persons such as doctors, lawyers, and auditors so on. Their income is called mixed income. The flow of expenditure is basis of this method. Consumption and investment and expenditure per se by the government are three areas that come under this method. To put it simply, the sum of expenditure on final goods and services less depreciation of capital assets can be considered as the National income. As mentioned earlier, only the final products must be taken into account and not the intermediate products that go into the making of the final products. This avoids double counting. In spite of these three methods to measure the National Income, there are certain difficulties that make an exact measurement of National Income impossible; we will look into those reasons in our next session.